GoldFinger is a perfect web-based ideal platform to enable Time Attendance, Human Resources, Roster, and Payroll Developers to deliver an integrated fingerprint recognition solutions to end-customers. 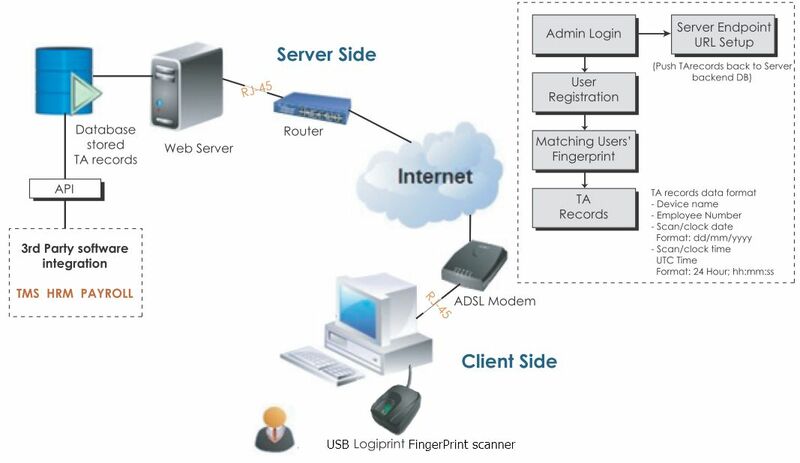 GoldFinger has a server-based application to manage all remote users clocked by a USB LogiPrint FingerPrint scanner. It is easy to administer users from a central location,and automatically synchronizes the user data from multiple devices with ease, requiring virtually no input from the user. GoldFinger is also scalable, consolidate staffs’ time records data from remote sites via the Internet Cloud. Web-based solution with user friendly GUI to manage users and the remote site devices. Only Internet Browser is required. Automated data synchronization with no input from the users. Use MS SQL database, simple and easy 3rd party application integration via GoldFinger API.